The Republican state convention met on September 20 at Syracuse, New York. Charles J. Folger was Temporary Chairman until the choice of Chauncey M. Depew as Permanent Chairman. Ward Hunt and John K. Porter were nominated for the Court of Appeals by acclamation. Francis Barlow was nominated for Secretary of State on the first ballot (vote: Barlow 191, Charles H. Van Wyck 172, Daniel E. Sickles 3, Chauncey M. Depew [incumbent] 1). Thomas Hillhouse was nominated for Comptroller on the first ballot (vote: Hillhouse 253, James A. Bell 82, Tracy Beadle 25). John Howland was nominated for Treasurer on the first ballot (vote: Howland 208, George W. Schuyler [incumbent] 146). John H. Martindale was nominated for Attorney General by acclamation. J. Platt Goodsell was nominated for State Engineer on the second ballot (first ballot: Goodsell 123, Charles K. Graham 123, William B. Taylor [incumbent] 72, Charles W. Mentz 26, Daniel C. Jeune 21; second ballot: Goodsell 200, Graham 153, Taylor 7). Robert C. Dorn was nominated for Canal Commissioner on the first ballot (vote: Dorn 186, Alexander Barkley 160). Henry A. Barnum was nominated for Prison Inspector during the first ballot. Patrick H. Jones was nominated for Clerk of the Court of Appeals by acclamation. The incumbent Porter was re-elected. The incumbent Robinson was defeated. 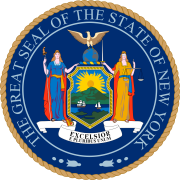 27 Republicans and 5 Democrats were elected to a two-year term (1866–67) in the New York State Senate. 91 Republicans and 37 Democrats were elected for the session of 1866 to the New York State Assembly. ^ To fill the vacancy caused by the resignation of Henry R. Selden, a judge was elected to a six-year term.